Do I Drink Cold Flat Ginger Ale for a Stomach Bug? Kylene Arnold is a freelance writer who has written for a variety of print and online publications. She has acted as a copywriter and screenplay consultant for Advent Film Group and as a promotional writer for Cinnamom Bakery. She holds a Bachelor of Science in cinema and video production from Bob Jones University. Ginger has been advocated as a treatment for an upset stomach at least since the days of the Greek doctor Dioscorides. Ginger ale is a common home remedy for nausea and vomiting and is often seen at the bedside of people suffering from food poisoning, gastroenteritis, morning sickness or the complications of chemotherapy. Many people find it soothing to the stomach and an easy way to replenish their fluids and electrolytes. Many doctors also agree -- but with caveats. According to Chau Che, a resident doctor at New York University Medical Center, the gingerols found in ginger root may help regulate the movement of the gastrointestinal muscles, helping to maintain a downward motion while inhibiting the upward motion that causes vomiting. Galanolactose may also inhibit vomiting by blocking the neural pathways that trigger the emetic center in the brain and by neutralizing the free radicals that stimulate stomach upset. However, studies on the effectiveness of ginger in reducing vomiting have returned mixed results. In a study published in a 2004 issue of the "International Journal of Gynecological Caner," ginger was found to be as successful as an anti-emetic. However, according to another study published in a 2009 issue of "Supportive Care in Cancer," ginger caused no significant improvements when taking with the antiemetic. Regardless of ginger's effect, most ginger ales contain little or no real ginger. However, the ale is easily digestible, which makes it a soothing drink that is likely to stay down. According to Health Guidance.com, carbonated drinks can cause gas bubbles to form in the stomach, which may further disturb an upset digestive system. 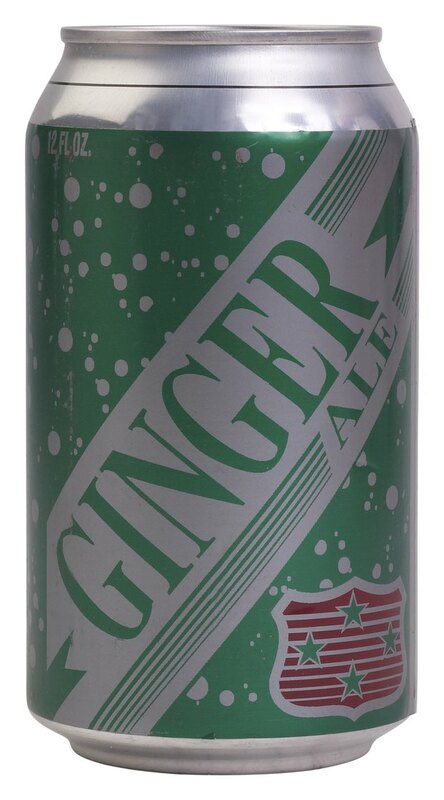 For this reason, you should never drink ginger ale straight out of the can. Always allow it to sit at room temperature until the fizz has disappeared. You can also pour it from one glass into another several times to hasten the release of the carbon dioxide into the air. When the drink tastes "flat" it is safe to consume. Very cold liquids can shock the digestive system and are not a good treatment for an upset stomach. Allow the ginger ale to come to room temperature before you drink it. Also avoid adding ice to your drink. If you store a couple cans on a shelf instead of in the refrigerator, it will be ready to drink almost immediately when you want it. The University of Michigan recommends that you do not drink ginger ale or other liquids until several hours after you have vomited. If the vomiting slows or subsides, first try sips of water until you see if it will stay down. After this, you can graduate to ginger ale. Slowly sip it to avoid overloading your stomach. Frequent small sips are more effective than infrequent long drinks. Do not rely on your thirst alone to judge how often you should drink, but if the thought, taste or smell of the ale increases your nausea, wait until later. However, after you can keep it down, take a sip every 20 to 30 minutes to begin replenishing your fluids.